A non-stock and non-profit organization, Kanlungan ni Maria is a home for the aged in the Philippines serving to provide true home to all abandoned, poor, sick and homeless elderly in the country. One of the nearest home for the aged sanctuary in Manila, their mission is to provide adequate and sufficient shelter and basic needs to old people and combine them with love, attention, affection and support in all aspects of life in an environment that is homey. All these is attained with the help of volunteers who are willing to take the best of care to offer to the disadvantaged elderly while they help in trying to locate their family to reconcile them. Part of the program is also to provide all needed medical supplies and attention for a better care. If you want to get in touch with Kanlungan ni Maria home for the aged, or make an inquiry regarding their programs, services and requirements for admission, please visit their official website here or contact their hotline telephone numbers by filling up a short form on their website. In the meantime, there are number of ways with which you can communicate with the people behind this non-profit organization. We have the list below. Looking to provide your quality time to help the elderly as a call to action? You can be a volunteer. All you have to do is to see first the different activities for well being and start from any on the list that you are willing to provide. Related actions for volunteering is also accepted. If you want to donate in any form to Kanlungan ni Maria home for the aged, please consider using any of their bank accounts for cash donations. 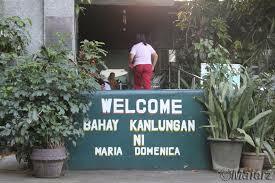 Account Name - KANLUNGAN NI MARIA - HOME FOR THE AGED, INC.
Account Name - RCABAN KANLUNGAN NI MARIA . If you need to see pictures / photos and what the people behind the non profit organization is doing to help the homeless elderly in some parts of Manila, please visit their official Facebook Page. There, you will see the different activities undertaken in the institution to enlighten the lives of the old people that volunteers care for. If you wanted to know how to get to the home for the aged, please see a relevant post here. We have featured a map that gives a guide on how to get to the home for the aged in Antipolo City. Use this as your guide or if you have a GPS tracking device or app in your mobile phone, it would be easy to get there using this same map guide. It's a good vibe to celebrate your birthday with the old people at the home for the aged. Most any occasion, you can actually come over the share some love with the people in the institution. See them give love in return and share their wholesome self.